Earlier today I linked to a post from Eric McGhee suggesting that the post-2010 gerrymandering of the House by Republican legislatures had only a modest effect on this year’s results. You will be unsurprised to learn that I got a lot of pushback on this, which prompted me to go back and check out other research on the subject. Before I got too far, though, I remembered that Sam Wang had done a bunch of work on this, so I went over to his site to see what he came up with. 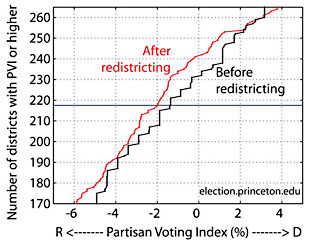 Prior to 2010, there was no systematic, nationwide effect from gerrymandering. (See here for more on this.) There was an incumbency effect, in which the majority party has a tendency to keep its majority, but otherwise no net lean in the direction of either Democrats or Republicans when you account for district lines in all 50 states. The 2010 redistricting was more one-sided than in past years. As a result, there’s now a net, systematic, nationwide lean in the direction of the Republican Party. The size of their advantage is calculated as the average vertical distance between the red and black lines in the chart on the right, which turns out to be 6.3 seats. So the 2010 redistricting really was unusually partisan. But the size of the Republican advantage turns out to be about six seats, very similar to what Eric McGhee came up with. The incumbency effect is about double that, for a total built-in Republican advantage of roughly 20 seats. Accounting for uncertainty, the Republican advantage is 10-30 seats, which is right in line with how much they outperformed the popular vote this year. I’m interested in further research on this subject, but for now we’ve got two methodologies that produce pretty much the same result. The Republican gerrymander following the 2010 census has given them a permanent tailwind of about six seats, and they’ll keep this for the rest of the decade. Combine that with the incumbency effect, and Democrats are unlikely to regain the majority unless they win about 52 percent of the popular vote.